Plants creeping or stoloniferous. Stems to 15 dm, 1.5–2 mm diam. ; branches erect, short, leafy. Leaves: stipules 3–5-fid; petiole 0.3–1 cm; blade 2–11 cm, leaflets 4–7 per side, bright shining green, oblong or elliptic, 4–17 mm, margins crenate-dentate, teeth 8–15, smooth adaxially, abaxial surface glaucescent, usually pilose on veins and margins, adaxial sparsely pilose. Scapes axillary, 10–15 cm, 1–2 mm diam., smooth, lacking both cauline leaves and multicelled hairs. Inflorescences 80–100-flowered, globose heads (9 mm diam. in flower, 20–35 mm diam. in fruit); bracteoles linear, pilose. Flowers 3.5 mm diam. ; sepals 4, triangular, 1.5 mm, abaxially pilose, adaxially glabrous; stamens 2(or 3), filaments 1.5–2 mm, anthers white; stigma white, fimbriate. Fruiting hypanthia obtriangular, 3.5–5 mm diam., surfaces sericeous, 4-angled, each angle with a slender spine at apex, red, sometimes lemon yellow, 7–12 mm, spines with 4–10 translucent, retrorse barbs 0.5 mm at apex, surfaces glabrous. 2n = 42 (New Zealand). Introduced; Calif., Oreg., Pacific Islands (New Guinea, New Zealand), Australia, also introduced in Europe (England, Ireland). 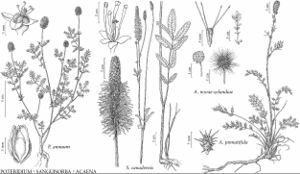 Herbarium records of Acaena novae-zelandiae are from the coastal ranges in California, Humboldt and Sonoma counties, around San Francisco and Monterey, and in Oregon. Acaena novae-zelandiae has noxious weed status in the United States. The name A. anserinifolia (J. R. Forster & G. Forster) Druce was misapplied to A. novae-zelandiae by P. A. Munz (1968), this being the first published record of the taxon from North America.